Free Travelling Gnome Toy Knitting Pattern by Raynor Gellatly. 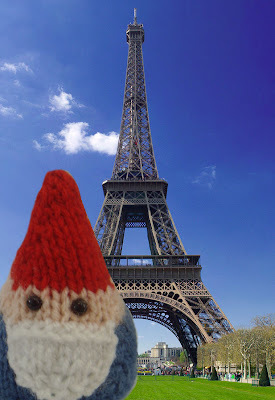 If anyone has ever seen the magically whimsical film Amelie then they will know about the story of the travelling gnome. If you haven't seen it then basically it tells the tale of a gnome who was stolen from her fathers garden and only to be returned with pictures of him at famous landmarks around the world! So when I seen the Simply a gnome! pattern by Else Tennessen I knew I had to make a knitted version, just like the little Amalie gnome. He is quite simple to make, although his base is a little tricky wiht the increasing but otherwise really quick to knit up and super cute when he's done. 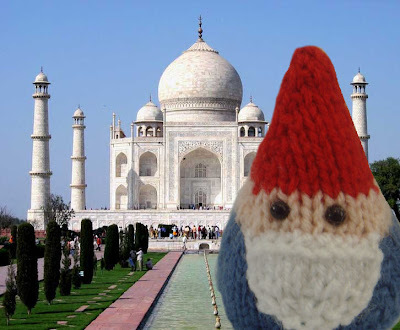 So if your going on your travels soon or you know someone who is then knit them up one of these little guys to take with them and then get them to take their own little travelling gnome pictures, I'd love to see any pictures if anyone did this. 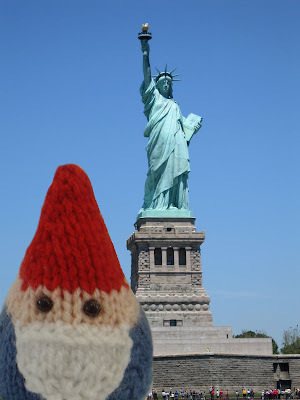 Here's pictures of my very own little gnome on his travels. 12. * kfb, k6* along (24 sts). 16. *kfb, k8* along (30 sts). Cut yarn, leaving a long tail. Use tail to mattress stitch row ends closed up to the top and secure any loose yarn ends. At this point you may want to add the safety eyes/embroider on eyes to the face of the gnome. Cut yarn, leaving a long tail. Use tail to mattress stitch row ends closed secure any loose yarn ends. You should be left with a flat disc like shape. Attach the base of the gnome to the body striching together the bind off edges, strop once you get 3/4 way round to stuff the gnome and then continue to close the remaining stitches. Weave in any loose ends. Use the long tail of the beard and attach it to the part of the body where the skin yarn meets the blue yarn (see photos as guidance). I cannot wait to make this little guy. I'm in love with all things gnomes so this will be especially exciting to make. What a great project and story. I added a link to my crochet and knitted toy page. Thank you for an adorable pattern! I love it and have printed out your instructions -- I just went through my yarn stash this past weekend to get some projects together to take on an upcoming trip --- will make this first, to HAVE on my trip! I especially want to thank you for your generous copyright --- so many folks are ill-informed, it's nice when a designer spells out exactly what the expect from those of us that browse the web for patterns. I love gnomes! So exciting! I just found your blog...I love it! Thank you for sharing all your lovely patterns. I'll be digging through my stash to find the perfect yarns for it this weekend. I love it! I think they would make great Christmas tree decorations too. Thanks! what a cute concept!! love that movie and love that gnome!! I made some of these guys. I geocache and I put several in caches (you put a treasure in and take a treasure out) but I kept one for me. He shows up in almost every photo of the scenery around the cache site. He doesn't travel far but we travel often and he is getting a lot of photo exposure. brilliant - thanks. mine will come to lille flea market this weekend.. well if he is finished by the time my train arrives! Just recently this this little guy and hes excellent - so much so that a did a wizard too! Piccys are on Ravelley! With the new Gnome film coming out soon I can see this being popular again soon! Any chance you could modify it to fit some of the characters from Gnomeo & Juliet? Thank you for sharing all of your patterns. I live on a sailboat and have very little room for books. These are perfect to download and travel with. I love them all. Thank you for sharing all of your patterns. I live on a sailboat and can not keep all the knitting books I'd love to have on baord. super cute! i've been looking for a pattern for my new little one due in may. I am wondering, do you think i would work to make the pattern bigger and felt it with wool? have you ever tried that? I love this! i've been looking for something like it for my new little one due in may to honor his big brother (it's a long story). any thoughts on making it bigger and felting it? do you think that might work? have you tried it? I've made 3 now. Different colours and now I'm making a tweed group!